Submitted by ratter on Tue, 2008-06-24 19:33. Levenger's CIRCA notebooks are pretty cool and one thing that is touted as cool is that yuo can remove pages and re-arrange pages. Here's the thing: you can also do that with three ring binders that we probably all used in school. So what is the deal about Circa? Second, who wathces Law and Order Criminal Intent? The male detective has a three ring notebook that he uses a lot. Does anyone know what kind it is and where I could get one like it? Submitted by nay nay on Tue, 2008-06-24 19:41. Submitted by ygor on Tue, 2008-06-24 20:07. You can fold the cover of a disc bound notebook around to the back. Ring binders cannot do that. Disc bound notebooks are not restricted to the size of paper you can put into them. With a ring binder, anything smaller than the distance between two rings would not work very well. Ever drop a ring binder and have the rings pop open ? I believe a disc bound notebook is less susceptible to such a disasterous drop. They have been in my personal experience. Startup cost. Them desktop smurfalators ain't cheap. Materials cost. The heavier (costlier) paper works better than the thinner (cheaper) paper. However, I am willing to pay extra for an end result I like better. It's all opinion, and opinions are like strings. Every yo-yo has one. This is mine. Submitted by ratter on Tue, 2008-06-24 22:54. Submitted by ygor on Tue, 2008-06-24 23:56. The wikipage sez "He usually carries a well worn leather binder — roughly 9 x 12 inches in size"
Would I see The Binder if I was to rent/borrow a disc or three of season one ? Submitted by caligatia on Wed, 2008-06-25 03:12. His binder looks an awful lot like Levenger's 3-Ring Zip Folio. Although I doubt it's an actual Levenger product. Submitted by stephanie72978 on Thu, 2008-06-26 02:34. I have definatly seen his notebook but I cant remember what it was. It would seem to me that the type of character he plays may be a little obsessed with his notetaking too like us. For some reason he reminds me of myself I think that is why I like his character so much. I wonder if in reality he is truely like that...hhmmmmm. May be another faithful Levenger customer. Speaking of Levenger, whats the deal with their "stock uo sale"? I was thinking it was wonderful get it for the sale price then use the 20% off coupon. To my dismay it adjusted the prices back to the regular price and took off the 20% only which ended up being a little bit of a better deal. Although I was really hoping to get the sale and discount together. I was so excited but then got knocked down a few notches....oh well. Submitted by flexiblefine on Thu, 2008-06-26 01:59. For me, the thing that makes a Circa notebook most attractive as a planner is the ability to fold over the cover. This means a Circa notebook can take up half the desk space a 3-ring notebook would use. I've got a blue Circa bookcloth notebook waiting to be my new planner when I use up the paper I've punched for my ring binder. Junior/classic size. The bookcloth blue is very similar to the color of the sapphire True Writer Metalist, if you want a matching pen. Circa bookcloth covers are currently on sale. Yes, I should have waited. Submitted by Rollafool on Thu, 2008-06-26 23:33. The ability to fold over is what got me looking at Circa/Rolla too. 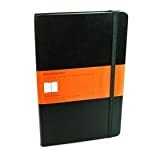 I used to use legal pads in notepad holders, and folding the cover over to the back cracked the spine regardless of whether it was a cheap vinyl holder or an expensive leather one. In fact, the cheap ones seemed to last longer! I also used 3-ring binders for projects, but I found that over time the rings would often misalign, resulting in torn and/or loose pages, and the open/close mechanism would gradually wear out. I didn't think I was very abusive, but maybe I was! Circa/Rolla has the advantage of having no mechanical parts to wear out. The expense issue is a valid concern, but I've found that over time I am not spending appreciably more than when I was having to buy replacement binders, new file folders, etc. The poly and plastic last longer and the interchangeable components allow for constant reuse. YMMV, of course . . . Submitted by Chet on Tue, 2008-06-24 22:25. With Circa, there are no rings to pull apart and snap back in place (which can make an awful noise). Instead, it's the pages you pull away from the discs, which is less distracting than pulling and snapping back rings. Submitted by jonglass on Wed, 2008-06-25 00:08. Vincent D'Onofrio? or the new guy? Submitted by Glenda (not verified) on Wed, 2008-06-25 00:54. Another reason to watch. But which detective is it? I haven't noticed Vincent D'Onofrio using a notebook, but I haven't watched much recently so may have forgotten. Submitted by ratter on Wed, 2008-06-25 01:38. It's D'onofrio who uses the notebook. Submitted by xena on Wed, 2008-06-25 07:46. Yup. Should be on the recent episodes- i watched a marathon, and, also (sadly) noticed the folio. Not sure if it has rings. Submitted by caligatia on Wed, 2008-06-25 07:50. Submitted by ygor on Wed, 2008-06-25 18:13. 3 or more than 3 ? Submitted by caligatia on Wed, 2008-06-25 20:06. Submitted by Glenda (not verified) on Thu, 2008-06-26 00:46. It's definitely 3-ring, and looks like leather with a zipper. Wonder how it's fitted out inside--pockets, pen loops and notepad slots, etc? Submitted by ratter on Wed, 2008-06-25 18:43. Yes, I was pretty sure it has rings. Submitted by ratter on Wed, 2008-06-25 20:57. Where I live they have reruns at 11:00pm Mon-Fri. I watch when I can stay awake. Submitted by hblanchard on Thu, 2008-06-26 21:26. 5. I can fit several different page sizes - yeah, I know, circa is touted as having this feature uniquely, but that's not my experience. I've been punching 3x5 satellite cards to fit in my ring binder for a long while. Also, other paper that is not 8.5" c 5.5" (such as Levenger old-style junior pads) can easily be punched in to fit (and my 7-ring punch was so cheap at eBay I could afford to buy 2, one for home and one for office). In fact, using my old stock Levenger pads and punching them into my binder once I fill them out is now my major path for capture and inbox as per GTD. 6. I can moved large sections of pages easily in one hand grab. I once tried this with an Atoma (functionally the same as Circa) and found I had to take pages out one or two at a time to move a whole block of pages (1/4 inch). It was very tedious. Okay, I do grant that Circa can be folded over, and takes less desk space. However, in my method of use, this is not really a stumbling point. My binder is the center of my organizational efforts. For portable note-taking I have smaller and more portable notes, cards, and books. In fact I have no objection to Circa or people who love them, but I have not found their siren-call to be irresistible! Submitted by ratter on Fri, 2008-06-27 23:10. I have used 3 ring binders in the past myself and find that buying a good quality one takes care of some of the problems mentioned here. Submitted by busylilnurse on Sat, 2008-06-28 08:28. They are like 3 ring binders on steroids,lol. I love them. I have three or four. The last ones were on sale for 8.00. I love that you can fold the front back, rearrange to your hearts content and they even come with plastic pocket pages. Submitted by B0TTiG on Thu, 2008-07-10 00:52.
i'd suggest the better binder as well. Sturdy, yet flexible. Plastic cover pocket and interior pockets as well. Easy open "D" rings that hold quite a bit more than the usual circular ring. The best part is the rubber on the binding and edges that keep it from slipping around and falling if they are stacked.